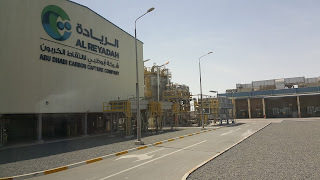 Two Energy & Environmental Research Center (EERC) staff members recently attended the Carbon Sequestration Leadership Forum (CSLF) Mid-Year Meeting in Abu Dhabi, United Arab Emirates. The CSLF works with 26 member governments across six continents to address key technical, economic, and environmental obstacles in the development and deployment of carbon capture and storage (CCS) technologies. CCS technology can capture carbon dioxide emissions produced from the use of fossil fuels in electricity generation and industrial processes, and deposit them in an underground geologic formation, preventing emissions from entering the atmosphere. John Harju, Vice President for Strategic Partnerships, participated on a panel of experts from across the globe entitled Carbon Utilization Challenges and Opportunities. He discussed enhanced oil recovery in unconventional shale plays, such as those found in the Bakken Formation in North Dakota. The EERC leads a number of major carbon capture, utilization, and storage programs, including the Plains CO2 Reduction Partnership and the Partnership for CO2 Capture. EERC Principal Engineer John Hamling presented an update on the U.S. Department of Energy National Energy Technology Laboratory’s Brine Extraction and Storage Test projects. Two of these field projects are in the United States—one in Florida and one in North Dakota. The North Dakota location is led by the EERC and involves field-testing brine extraction as a means of improving storage potential of a geologic formation. 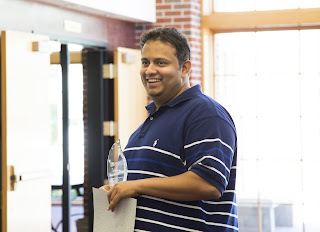 Saurabh Chimote, Senior Software Development Engineer at the University of North Dakota (UND) Energy & Environmental Research Center (EERC), has the unique distinction of being named the Student Employment Supervisor of the Year in three categories – UND, the state, and the region. The awards were presented during a reception at the EERC on May 15. The awards are given by the Midwest Association of Student Employment Administrators. For the UND award, his name will go on a plaque in the student employment office. The North Dakota statewide award includes a cash prize of $50, and the regional award includes a cash prize of $100. There are 14 states in the regional association, and the regional award is the highest level at which the award can be given. Chimote has been supervising students since 2013 when he initiated their hiring to help with software development. This real-world experience is a complement to their academic studies. Chimote provides an atmosphere in which students thrive and succeed. Chimote’s approach prepares students for their future professional expectations by moving them from an academic setting to a business environment where they focus on client needs. He uses his extensive technical knowledge to support the students in their work. Left to right: EERC Staff Harry Duchscherer, Andrew Palmiscno, Saurabh Chimote, Sara Lahr, and UND Students/EERC Employees Aaron Johnson and Christian Hansen. Chimote holds both an MBA and an MS degree in Information Systems from the University of Cincinnati, a Bachelor of Engineering degree in Information Technology from Nagpur University, India, and a diploma in Computer Technology from the Board of Technical Education, Mumbai, India. University of North Dakota Energy & Environmental Research Center staff recently held a donation drive to benefit Northlands Rescue Mission. The Mission’s new director, Sue Shirek, accepted the donation on May 12 during a visit to the EERC. Northlands Rescue Mission director Sue Shirek (second from left) accepts donations from EERC employees. Pictured left to right: EERC CEO Tom Erickson, Shirek, and EERC staff members Sheryl Landis, John Kay, Rhonda Olson, Wes Peck, Janelle Ensrud, Amanda Livers, and Sue White. The effort was spearheaded by the EERC’s Social Cause committee, which is a group of employees that volunteer within the community. The committee selects a charity each year and raises money, donates goods, or volunteers their time at that organization. This year’s work at the Northlands Rescue Mission includes assembling meals for the Backpack Program, sorting food and clothing donations, or working in the Mission’s store, where residents can get personal care and other items. “It is amazing to work at a place with people that have this much generosity,” says Amanda Livers, EERC Research Scientist in Geophysics and Social Cause committee chairperson. The supply drive for the Mission was supported by a fun competition among teams of EERC staff. Over the course of the eight day competition, over $10,000 worth of necessities were collected. Last year, the committee raised over $5,400 for the Altru Health Foundation through their Spin for Kids fundraiser, which was the second-largest amount raised by a team in 2016.